Burcu Uyar was born in 1978. 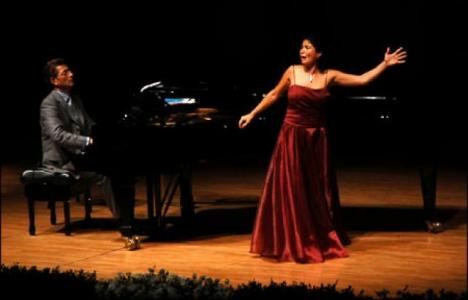 She graduated from the Opera Department in the State Conservatory of Hacettepe University. She performed in the Offenback’s “Les Contes d’Hoffmann” with the Izmir State Opera, and in “Don Carlos” with the Ankara State Opera. In 2002, Uyar won an award with the role of “Olympia” in a competition and performed in many opeas in Brescia, Cremona, Como and Pavia. In 2004, she was accepted into the Cnipal Opera Academy and gave a concert with the Schola Cantarum Orchestra in Paris. She won an award in the ALDECA competition. Uyar was selected to the most important “Coloratura Soprano” in the Classical Music Television Channel “Mezzo.” In 2006, she won first prize in the European Opera Singing Competition, which was held in Mannheim. In the same year, she received third prize in the 4th Leyla Gencer Opera Contest. In 2011, she received an award in the category of “Opera Artist” in the Donizetti Classical Music Awards. Currently, Uyar sings as a soloist in many famous operas and gives many concerts in Europe.